Passionate about the Atlanta BeltLine? If you’re interested in the BeltLine’s history, vision and goals, BeltLine U is the place for you. The 4-month long civic university is a pilot program of Atlanta BeltLine, Inc. that will explore the history, vision, programmatic elements and implementation strategy of the BeltLine. BeltLine U consists of 8 sessions facilitated by staff of the Atlanta BeltLine, Inc. and its project partners. Graduates will have in-depth program knowledge that they can then share with others in the community. The inaugural class is underway and will graduate in May 2019. 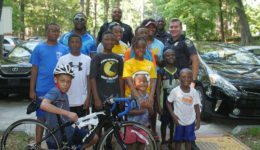 The Atlanta BeltLine started as a grassroots movement and continues to be fueled by community involvement. This program is the perfect opportunity for those who are passionate about the Atlanta BeltLine, who would like to learn more about the project and who want to take a more active role in its evolution. The admissions process will strive to ensure a diversity class of participants–with priority given to residents of the City of Atlanta and Atlanta BeltLine neighborhoods. Thank you for your interest in applying to Atlanta BeltLine U. The application period is now closed. Check back here for details when the next application period opens. If you have any questions, please send us an email at engage@atlbeltline.org.